Do you already have a great sewing machine? How about exploring the wonderful world of embroidery? The Brother Innov-IS 800E is an outstanding embroidery machine that will enable you to create high quality embellishments. The Brother Innov-IS 800E would certainly be a fabulous addition to your workroom. The machine is extremely compact and yet provides a generous work area. You can remove the embroidery unit when you store the machine of you are tight for space. No less than 138 embroidery designs are built in so you are ready to get creative immediately. There are 11 different fonts for monogramming and editing your patterns is simple using the LCD touchscreen. You can mirror, re-size and rotate your designs and you are also able to edit the colours. 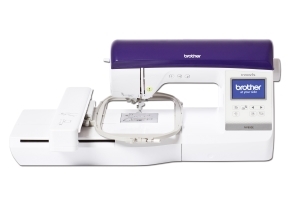 The LCD screen enables you to preview your patterns and when you are happy with your designs the automatic needle threader means you can start sewing quickly. You can work at 850 stitches per minute and there are top and bottom thread sensors to warn you when your thread is running low. If you want to explore more patterns then you can use the USB port to upload unlimited designs from your computer. You really can embroider any design that you wish and create the most beautiful embellishments for clothing, accessories and home furnishings. Would you want to be without this machine?